A study near four Seattle schools found that Issuing speed-camera traffic tickets reduced violations. 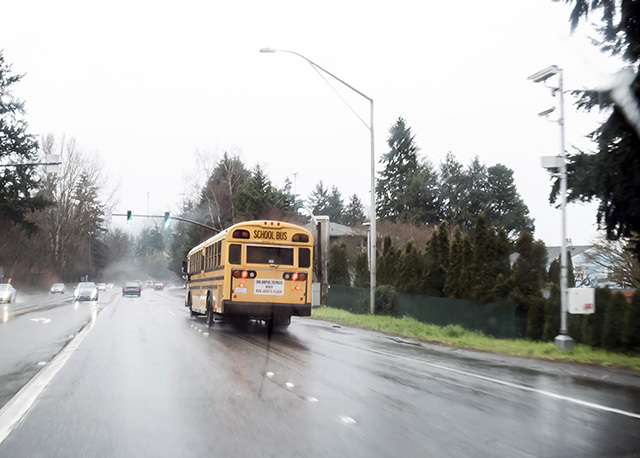 A school bus follows its route on a rainy Seattle day. School zone speeding violations tend to spike after school breaks, weekends and summer vacation, but automated photo enforcement may help slow down motorists and keep kids safer. These are the findings of a study published in Injury Prevention by researchers at University of Washington School of Medicine and Drexel University. This study is the first to examine the effects of speed limit photo enforcement in school zones. The researchers found that, after police began issuing tickets based on automated photo enforcement, the rate of speeding violations decreased nearly 50 percent in the school zones in their study, compared to the period when drivers received written warnings. The proportion of vehicles exceeding the 20 mph limit decreased by nearly half in the citation period compared to the warning period. The deterrent effect of automated enforcement was sustained over two years. “The 20 mph speed limit is the most important step to ensure that kids can walk and bike to school safely,” said lead author Alex Quistberg, assistant research professor of environmental and occupational health at the Drexel University Dornsife School of Public Health in Philadelphia. “In addition to the safety benefits, slowing down car traffic encourages kids to walk, bike or bus to school, which have been shown to improve child health and concentration,” said co-author Beth Ebel, the Safe and Active Transportation section lead at the Harborview Injury Prevention & Research Center and a professor of pediatrics at the University of Washington School of Medicine in Seattle. Vehicle speed reductions could have far-reaching effects in reducing child deaths. Most collisions with child pedestrians happen near schools. Vehicle speed significantly determines the risk of severe injury. For example, a pedestrian has a less than 10 percent chance of being fatally injured by a vehicle traveling 20 mph, but that risk jumps to 50 percent when the vehicle is traveling 40 mph. In Seattle, school zone speed limits are set at 20 mph. The four Seattle elementary schools included in the study were near locations where the Seattle Police Department and the Seattle Department of Transportation had installed vehicle tracking and photo enforcement technology in fall 2012. The researchers examined data collected through January 2015. Because number of vehicles passing through the school zones stayed constant or rose slightly during the enforcement phase, drivers likely didn’t opt for alternate routes to avoid the cameras. Hourly data on vehicle numbers and speeds in these school zones was not available prior to the photo enforcement warning period, so researchers were unable to study how the warning period alone may have altered driver behavior. Additional research on a larger scale, such as monitoring school zones at more locations, over longer periods of time before and after photo enforcement implementation, and in a greater variety of road and travel conditions, could give researchers a fuller picture of the influence of photo enforcement on school zone vehicle speeds. As a topic for further research, the study authors were also interested in school zones as potential factors in the overall health of children in the area. Kids with built-in physical activities in their schedules, such as biking or walking to school, experience significant and long-lasting health benefits. Prior studies, however, have shown safety concerns are a major reason families don’t choose these options. The study was supported by Harborview Injury Prevention & Research Center and the Eunice Kennedy Shriver National Institute of Child Health and Human Development of the National Institutes of Health. The Seattle Department of Transportation, Seattle Police Department, and American Traffic Solutions, Inc. provided access to the data. The Harborview Injury Prevention and Research Center studies why injuries happen, and what can be done to avoid them. HIPRC is affiliated with the University of Washington and Harborview Medical Center, a part of UW Medicine. Its mission is to reduce the impact of injury and violence on peopleʼs lives through research, education, training and public awareness.